In a globalised world mediated by mass communication, controlled by pre-existing aesthetic conditions of appropriation and irony, a world dictated by repetition yet unpredictable in its future, the role of the architect seems increasingly arbitrary. This raises some compelling questions for those interested in architecture. As an architect, how does one use the formal devices of space, materials, structure and consider the brief, whilst grappling with the complexities of time and place at the fragile beginnings of the twenty-first century? 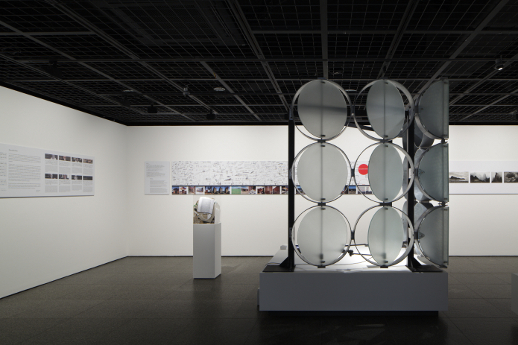 The 25th Anniversary Exhibition of Toto Gallery MA – “Global Ends: Towards the Beginning” – is an ambitious project showcasing seven architects from across the globe together with a commemorative symposium held at the Architectural Institute of Japan, that seeks to address these crucial issues of architecture today. 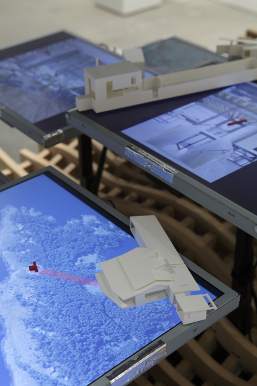 The gallery space itself balances the line between an art exhibition and architecture through the sensitive placement of photos, videos, models and screens. As a collective, each architect’s practice is characterized by the influence of nature. Australian architect Sean Godsell, both in the exhibit and at the symposium, spoke of the Australian horizon as a major influence on his practice. Certainly the geographical displacement and the harshness of climate, as well as the reality of distance, became a key feature in his use of materials and the fluidity of space. Of particular note was the demarcation of inside/outside and his integral use of solar power/hot water technology. Interestingly, the ‘horizon’ as an ordering device of ‘flatness’ shared similarities with a Japanese sense of asymmetry and flat design. This observation was reaffirmed with a comparative look at the practice of Japanese architect Junya Ishigami. 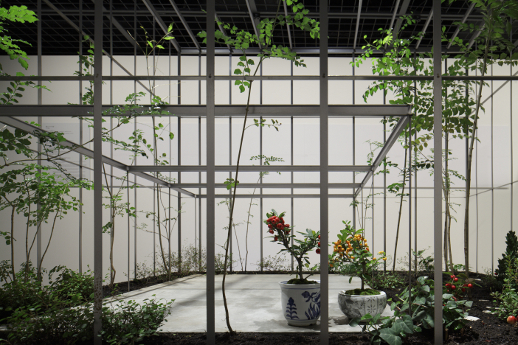 His works are of a conceptual flatness, or more accurately, of a blurring and non-differentiation between the environment and landscape, the Japanese garden, that all precede ‘the house’. Space and architecture as a methodological notion comes second to making the landscape, according to his views. For his sense of materiality, however, Ishigami shows an innovative and experimental flair: he aspires to emulate the transparency of space and air, through the thinnest proportions of fiber, glass, and acrylic. His sense of scale moves beyond conventional ideas, as shown by his KAIT workshop. Exploring further the sensuality of architecture, RCR Aranda Pigem Vilalta Arquitectes from Spain, not only display a strong influence of nature in their practice, but also are informed by the dichotomy of man and woman as dualities that exist as structural concepts. Other dualities that shape their buildings are the public and the private, the urban and the rural, as well as their aspirations of creating space through non-gravity. The issue of scale becomes less important as a physical means, but rather a matter of understanding and consciousness of physicality which helps to achieve integrity in their architectural practice. This awareness of scale is also referred to in the practice of Seattle-based Tom Kundig of Olson Kundig Architects, whose houses also reflect the hardiness of his childhood environment and, through his rejection of an overly digitalized method, he aims to “bring back the scale of architecture to the human.” His symbolic motif of the “hot rod” becomes a metaphor for an overall need to return to the core of architecture, to the re-appreciation of tactile and raw materials, to the beauty of mechanics and engineering. At the symposium, he illustrated this point through his anecdote of a young girl who was able to lift up one of his garage doors made up of six-and-a-half ton of glass and steel, simply through the use of a wheel. A view expressed by Kundig and others is that for the city of the future, the myth of the ‘individual architect’, or the architect as hero, is long dead and that there is no individual architectural expression. This is true in some respects as walking away from the exhibition one gains a sense of a collective of architects, and not necessarily of uniquely different geographical contexts. In fact, in making sense of the disorder and unpredictable conditions, the direction of architecture today seems to be a return to nature through simplicity of materials. A return to humanity through the stripping back of extraneous information and down to organic smooth lines. In other words: a human architecture.